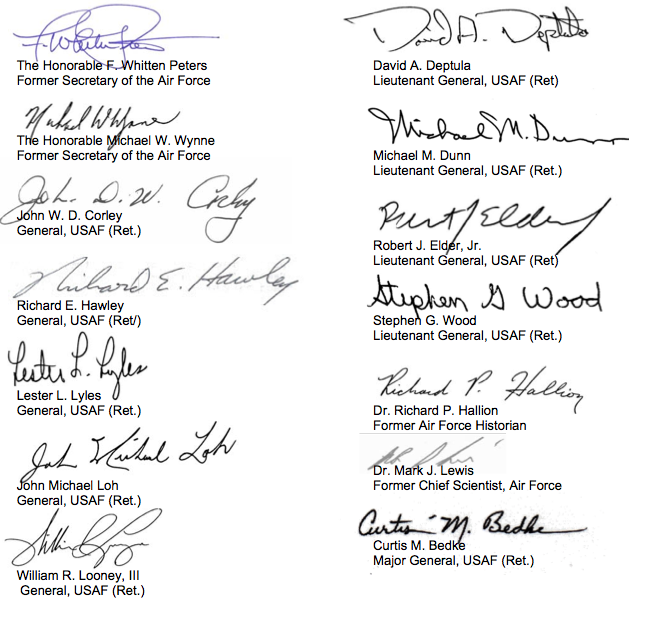 As we close our airpower forum, we want to recognize the importance of an Air Force Association letter sent to the Hill outlining their concerns about funding challenges undercutting the ability to have a new power projection strategy. 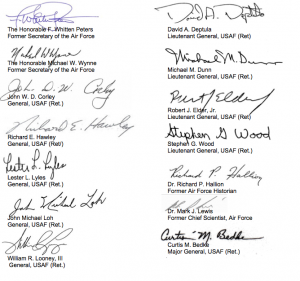 An impressive range of Air Force influentials weighed in and signed this letter and this is a letter which we centrally endorse. On Thursday, January 5th, President Barack Obama issued revised strategic guidance for the Department of Defense. The Commander in Chief explained that “as we end today’s wars, we will focus on a broader range of challenges and opportunities.” We are writing in support of this effort. The past ten years have seen the men and women of the armed forces serve with tremendous distinction. However, as we look to the future, it is critical to recognize that the nation has interests that extend past Iraq and Afghanistan. Department of Defense policies and priorities must evolve accordingly. This will be a challenging endeavor amidst resource constraints that will increasingly limit the scale and scope of available national security options. In the absence of solutions via mass, strategies adopted by the Department must focus on flexible, effective and efficient projection of power—not ones that center upon attrition and occupation. It is not in our interest to ask large numbers of young Americans to put their lives at risk when alternate means of attaining our goals are available. This places an imperative upon shaping regions through peaceful military presence, deterring potential adversaries with shows of force, and reassuring allies that we will be there for them with credible capabilities should the need arise. When combat action is required, we must ensure that our men and women in uniform are equipped to succeed. This is a basic moral imperative–one whose importance has been continually emphasized on the battlefields of Afghanistan and Iraq. The United States Air Force stands forth as a key element of this endeavor. Airmen do not just “support” policy objectives—they maximize global vigilance, global reach, and global power to accomplish them. Whether actualizing humanitarian operations or joint deployments, deterring potential adversaries through both conventional and nuclear capabilities, assuring freedom of action through air dominance, netting key effects with precision strike, providing critical intelligence, or saving lives through aero-medical evacuation—the Air Force is the indispensible element of the joint team. While the other branches of the military have regional air arms, only the US Air Force possesses the capabilities and capacity required to facilitate sustained global operations anytime, anywhere— attributes that stand at the forefront of the new strategic guidance. In the near-term, this requires investment in programs like the KC-46, F-35, and Next Generation Bomber. Over the long-term, we must not assume defacto preeminence when it comes to innovating and producing the next generation of systems. We must continue to invest in science and technology, research and development, and a robust industrial base. Decisions that we make today will govern the national security options available for decades into the future. In unveiling this new strategic guidance, President Obama declared that “the United States of America will remain the greatest force for freedom and security that the world has ever known.” We fully support this vision. The Department of Defense’s new policy vectors are a key step in helping secure this goal. However, the credible projection of effective power requires more than rhetoric. Capabilities and capacity matter. The Administration and Congress must empower this new strategic guidance with the investments necessary to equip our men and women in uniform for success—for today and tomorrow.